At 0955, lookouts called down that large formations of planes (were) approaching and the ship went to general quarters. Within minutes, the ship was underway with the executive officer, Lt. Lester O. Wood in command. ... Zigzagging her way through the crowded harbor, William B. Preston made for the open sea as Japanese planes droned closer and closer. The first wave of planes attacked the town and its nearby fuel dumps and docks; the second wave went after the ships in the harbor, with transports and cargo ships as the primary objectives. Within minutes of each other, transports Tulagi and Meigs took hits, and ships alongside the docks were heavily hit as bombs rained indiscriminately on the port area. ... Four bombs exploded off William B. Preston's bow breaking bridge windows. Heavy volumes of .30- an .50-caliber antiaircraft fire forced some of the attackers to keep their distance, but others pressed the attack with vigor. 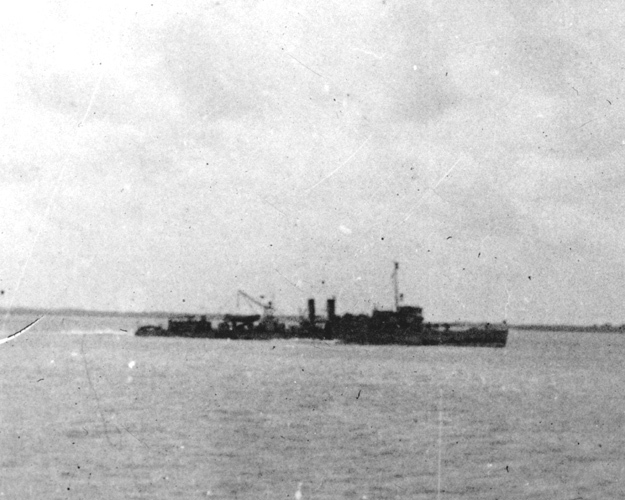 Peary (DD-226), slower in getting underway, was enveloped in bomb splashes as Japanese accuracy marked the ship for destruction. Heavily hit the hardluck Peary burst into flames and rapidly became an inferno as bomb after bomb tore the ship apart and forced her down by the stern. ... The seaplane tender's turn was next, however, and she was hit aft, just forward of the after deckhouse. The ship lost steering control forward, and, in the interim period between regaining control by handsteering aft, Lt. Wood conned and steered the ship using her engines and, despite a jammed rudder, succeeded in making for an opening in the harbor boom. Negotiating it by judicious use of engines and slight assistance from the rudder with direct hand steering, William B. Preston escaped the inferno that left Darwin shattered and ruined as a base of operations for the Allies. ... Heading south down the western coast of Australia, the ship took stock of her damage. Eleven men were killed, two missing, and three wounded by the bomb hit aft. The after living compartment was a mass of wreckage; rivets were popped and seams sprung, the after deck house was riddled with holes, the after 4-inch and machine guns had been put out of action. At about 1445, a Japanese Mavis patrol plane (Kawanishi E7K) attacked the ship, but her bombs splashed harmlessly into the ship's wake, and the plane discontinued her attack.